The scattering of ashes at sea is a wonderful and loving tribute for your loved one. Many times it may be in the will as a request because of their attachment to the sea. Or the surviving family members see this as a wonderful way for all to get together as a closing memorial service. We believe so strongly in honesty, transparency, and in giving. We are not a charter boat company or a commercial business. We are a non-profit public benefit charitable trust operating out of our office-5150 PCH, Suite 200 in Long Beach. You may notice in your search for the service that pleases you the most, that we are very unusual: we do not have additional charges which everyone else does, we do not charge more for weekends or holidays, we do not have a specific destination or a specific time of day we go out for we want you to be a part of the decision-making process and want to do everything at your convenience. For larger parties, more than 12 passengers, we can arrange for all of your guests to be a part of the ceremony at no extra cost by combining our passenger services with View-from-the-Pier. ""Dear Captain Pat and sons, My wife and I would like to thank you for the dignified and great service you provided on the 14th of June for our Daughter, Wendy. It was a trying day, and your good work and compassion made the entire evolution as something special-for that, we humbly thank you. Please know also, the family of a Veteran, that you provide one of the greatest services that a family could ever ask for. The very best to you and your sons. A burial at sea memorial service with the scattering of a loved one's ashes is a beautiful, moving, and touching alternative to the traditional graveside memorials. Our highly affordable sea burial memorial services are performed by Pat O'Connor, a Missionary, Ordained Minister, former U.S. Army Airborne Special Forces Green Beret officer and classical guitarist. He is often referred to as ‘Captain’ because of his Military rank during his service in Viet Nam. Our small intimate memorial ceremony is fashioned after the immediate family graveside services and planned around your personal preferences. We offer all types of services and honor all religions. In addition, your service can be the way you want it to be within legal limits. 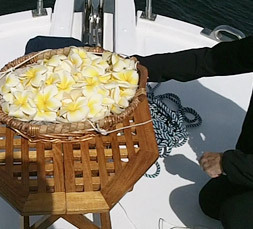 All that we provide is highly personal and professional as we handle every aspect of the sea burial ceremony for you. Our services are for both the general public and the Military. For the Military we help you with all the planning for a full Honor Guard Ceremony. We are a non-profit organization so therefore are going to be the least expensive and also include many free items for you that you would be charged for by other organizations such as food, drinks, roses, and professional photography. Because of our dedication to helping you in every way possible for the least expense to you, we also offer alternatives such as View-From-The Pier Services and Live Broadcasts. These alternatives will help reduce your expenses and may be very desirable for you and your party. You may be surprised how the View-From- The Pier Service can work best for you. Please review that page. We take great pride in delivering a truly special burial ceremony that will be remembered for a lifetime. Our services include event planning, flowers, help with restaurant reservations, bereavement counseling and so much more. At no cost to you, we provide Professional Photography, food, flowers and drinks as well. We also send to you a beautiful Memorial Certificate and letter, letters to the Mortuary and Crematorium, and file all of the necessary paperwork with the local health department. For the Military families as we previously mentioned, we help you to make the arrangements with the Honor Guard. Local restaurants love what we are doing and will help us in several ways when you would like to plan a memorial luncheon or a gathering before or after the scattering of ashes at sea. If this is appealing to you, we will discuss suggested restaurants. We would also like to announce that we now offer live broadcasts of the ceremony around the world! Everything is customized for you and will be discussed when you make your reservation. A family that witnessed one of our ceremonies said it was the most beautiful funeral they had ever attended. With the prayers, music, flowers, and gorgeous setting, that said it all. We were all so happy just to have been a part of a ceremony that meant so much to them. We have been so blessed with this ministry hearing from so many families expressing their gratitude and the wonderful experience they had. What it meant to them and to share it with them is beyond what I ever dreamed. Please call us so that we can help you, answer all of your questions, and hopefully demonstrate to you that we are the best. Please contact us with any questions about our services and learn what we can do to take the burden off of you.